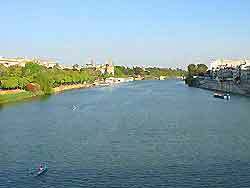 Serving as the capital of the autonomous community of Andalusia, Seville is situated within a favourable spot for day trips, being close to the attractions of Dos Hermanas, La Rinconada and Jerez de la Frontera. 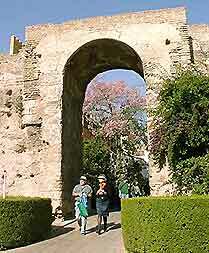 Sightseers should be sure to consider excursions to the ancient city of Itálica, where Roman remains are the main draw. The striking dolmens known locally as the Dolmenes de Valencina de la Concepción may also beckon, while Carmona is especially close to Seville and this town rises high above large agricultural plains. Carmona is called home by a number of impressive historic attractions, including several mansions, churches and also town squares. Somewhat further afield, both Malaga and Granada may also appeal as part of onward holiday plans. Dating from more than 4,000 years ago, this set of large and imposing dolmens is situated just outside of central Seville, in the Valencina de la Concepción area. Visitors will find around 20 dolmens in total, together with a short film presentation, and an interesting exhibition of artefacts and finds from past excavations on this very spot. The site can be easily reached by bus and visits should be arranged in advance. Originally a Roman city founded around 2,200 years ago, Itálica is full of wonderful artefacts and historic attractions. At the heart of the site is an enormous amphitheatre which once seated over 25,000 spectators. There is a display nearby that features many of the finds from the site and also some of the treasures are now housed within Seville's Museo Arqueologico (Archeological Museum) on the Plaza de América. You are able to wander around the site freely and enjoy the historic ruins, which include temple remains, mosaics on the floors of villas, traces of streets and also some Roman baths. The site is easily accessible by bus and there is a regular service that runs between Itálica and the city centre. 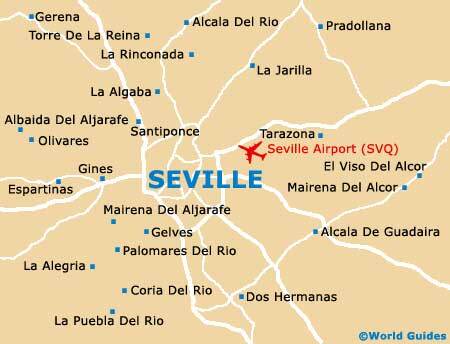 Carmona is situated around 38 km / 23 miles to the east of Seville and has much to offer day trippers. Highlights include the Plaza de San Fernando - with a Renaissance-style facade, the grand 18th-century town hall - with some well-preserved Roman mosaics in its courtyard, and the imposing ruins of the Alcazar del Rey Pedro - once the palace of Padro I. Just outside Carmona is the Necropolis Romana, comprising the extensive remains of a Roman burial ground. There is also a museum on the site, with interesting exhibits of artefacts, such as statues, glass, jewellery and urns, all once buried with the bodies. The thriving port of Malaga is Andalusia's second-largest city and is located around 217 km / 135 miles to the south-east of Seville. Malaga used to be full of vineyards in the 19th century, but unfortunately a disease ravaged the vines and killed the plants. Shortly after this, tourists began to spend time in this friendly city, particularly during the winter. Highlights include a large 16th-century cathedral, around which the old town radiates, the vast Alcazba, which was built between the 8th and 11th century with a Roman amphitheatre, the ruins of the Castillo de Gibralfaro and a 14th-century Moorish castle. The Museo de Bellas Artes may also be of interest and comes with many fine paintings by Murillo, Ribera, Morales and Zubaran, and also some childhood sketches by the world-famous artist Picasso. Just east of Malaga is the unspoilt beach of Rincon de la Victoria. Granada is a modern city roughly three hours from Seville and is a popular location for tourists to visit. There are several districts in Granada and these all have something different to offer visitors, such as historic buildings, churches, monasteries, large plazas, an enormous range of small shops, department stores, restaurants, cafés and bars, as well as an excellent nightlife. Particularly notable attractions include the Cathedral of Granada, the Royal Chapel, the Plaza Isabel la Catolica, the Plaza Nueva and the famous Alhambra palace / fortress.